Tomer's Take: On Friday ski Tahoe, Mammoth, Alta or Snowbird on Friday for big snow, on Saturday ski Wolf Creek, Telluride, Purgatory, Silverton, Aspen/Snowmass or Crested Butte and on Sunday ski Schweitzer, Sun Valley, Whistler/Blackcomb or Banff. Bonus: on Monday ski the Northeast. This could be the best week of the entire season at many ski areas across the West and the Northeast. I'm forecasting heavy snow at dozens of resorts. Why? The overall pattern is active with the primary jet stream ushering in two large storm systems loaded with moisture. El Nino has failed to develop and sea surface temps in the equatorial south Pacific have actually decreased since December 2018. The official forecast has downgraded the chance of a full-blown El Nino to 65% (down from 95%). Two storm systems keep the mountain snow going on Thursday, Friday, Saturday, Sunday and possibly Monday. Heavy snow accumulations on the higher volcanoes and Cascades. Light to moderate snow is likely on Thursday, Friday and Saturday. A heavier snow is possible on Sunday. Two storm systems keep the snowfall going between Thursday and Sunday. Heavy snow accumulations likely. Friday might hold the heaviest accumulations. Heavy snowfall continues on Thursday at Tahoe and Mammoth. It tapers off on Friday morning and should be an excellent powder day. 1-3 feet likely at Heavenly, Sierra at Tahoe, Kirkwood, Squaw | Alpine, Donner and south to Mammoth. A smaller storm is possible Sunday night into Monday. A large storm system delivers heavy snow to Utah on Thursday and to Colorado Thursday night through Friday. 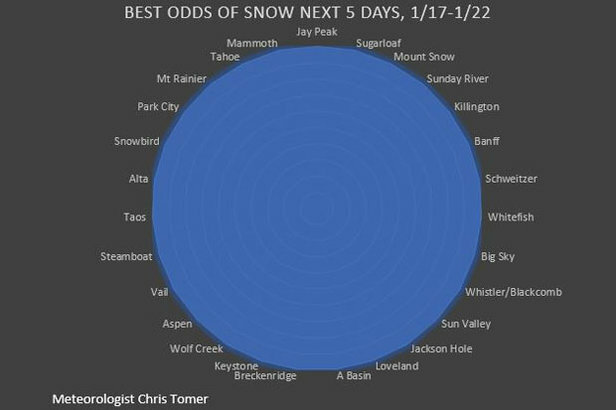 1-2 feet likely at Alta and Snowbird. Up to a foot in Park City, Canyons, Brighton and Solitude. 1-2 feet likely at Telluride, Silverton, Purgatory and Wolf Creek. A foot is likely in the West Elks around Aspen, Snowmass and Crested Butte. A foot is likely around Steamboat and Buffalo Pass. Saturday should be an excellent powder day. Another snowstorm is possible Monday-Tuesday in both states. 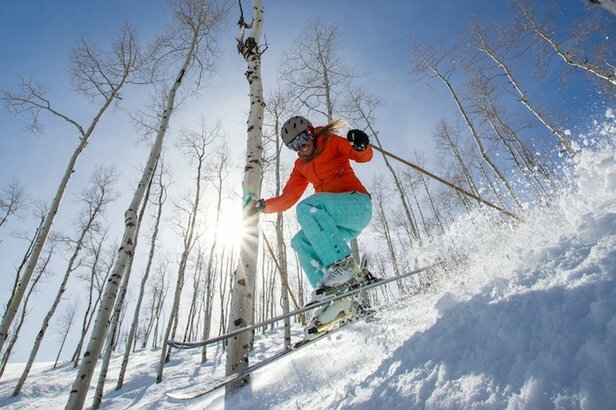 Ski Resorts with the best chances for snow through this weekend, 1.17.2019. 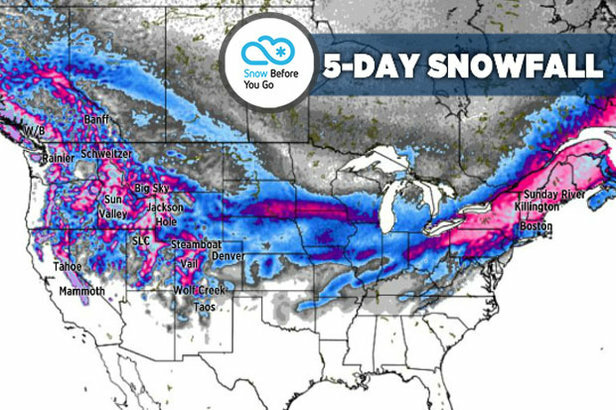 Two storm systems are lined up over the next five days with great snowfall. Moderate to heavy snowfall likely on Thursday and Friday. The second storm delivers moderate to heavy snowfall between Sunday night and Tuesday morning. Saturday and Sunday look like excellent powder days. Sun Valley, Schweitzer, Big Sky, Discovery, Whitefish, Jackson Hole and Grand Targhee are all in good position. An appetizer snow of 1-3 inches brushes the resorts on Friday. Then the main entree arrives between Saturday night and Sunday with 1-2 feet by Monday morning. Monday should be an excellent powder day and very cold. Killington, Okemo, Mount Snow, Jay Peak, Wildcat, Sugarloaf, Sugarbush and Sunday River all look good.